, a gentleman who deserves honourable notice in the literary history of his country, was the son of a woollen-draper in the parish of St. Paul, Covent-garden, and born March 17, 1728. He lost his father when about the age of twelve years; and his guardian not only neglected him, but involved his property in his own bankruptcy, and sent him to France. 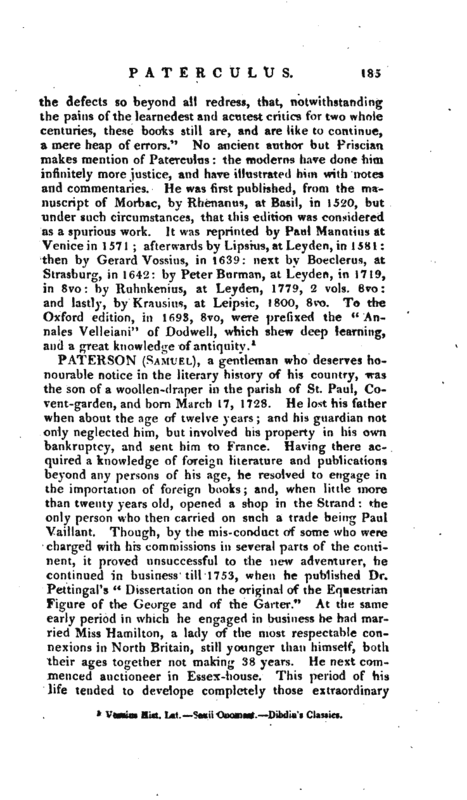 Having there acquired a knowledge of foreign literature and publications beyond any persons of his age, he resolved to engage in the importation of foreign books; and, when little more than twenty years old, opened a shop in the Strand: the only person who then carried on such a trade being Paul Vaillant. Though, by the mis-conduct of some who were charged with his commissions in several parts of the continent, it proved unsuccessful to the new adventurer, he continued in business till 1753, when he published Dr. Pettingal’s “Dissertation on the original of the Equestrian Figure of the George and of the Garter.” At the same early period in which he engaged in business he hacl married Miss Hamilton, a lady of the most respectable connexions in North Britain, still younger than himself, both their ages together not making 38 years. He next commenced auctioneer in Essex-house. 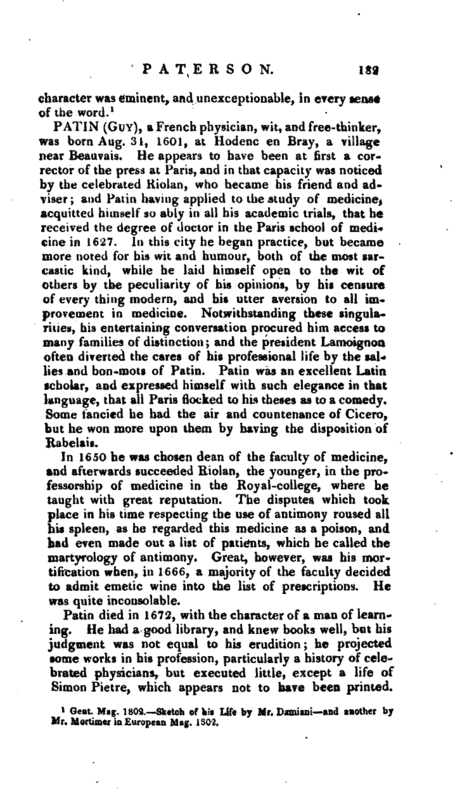 This period of his life tended to develope completely those extraordinary | talents in bibliography (a science hitherto so little attended to) which soon brought him into the notice of the literary world. The valuable collection of Mss. belonging to the right hon. sir Julius Caesar, knt. judge of the Admiralty in the reign of queen Elizabeth, and, in the reigns of James I. and Charles I. chancellor and under-treasurer of the Exchequer, had fallen into the hands of some uninformed persons, and were on the point of being sold by weight to a cheesemonger, as waste paper, for the sum of ten pounds; some of them happened to be shewn to Mr. Paterson, who examined them, and instantly discovered their value. He then digested a masterly catalogue of the whole collection, and, distributing it in several thousands of the most singular and interesting heads, caused them to be sold by auction, which produced 356l. ; and had among the purchasers the late lord Orford, and other persons of rank. These occurrences took place in 1757. 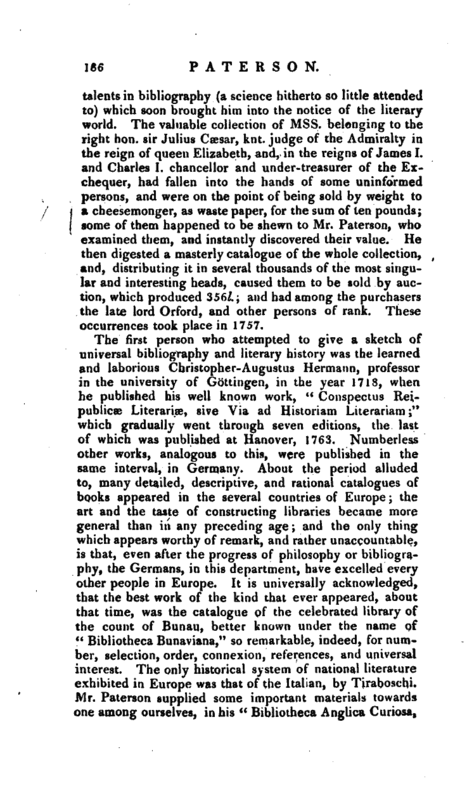 The first person who attempted to give a sketch of universal bibliography and literary history was the learned and laborious Christopher-Augustus Hermann, professor in the university of Gottingen, in the year 1718, when, ie published his well known work, ‘ Conspectus Reipublicae Literarioe, sive Via ad Historian! Literariam*’ which gradually went through seven editions, the last of which was published at Hanover, 1763. Numberless other works, analogous to this, were published in the same interval, in Germany. About the period alluded to, many detailed, descriptive, and rational catalogues of books appeared in the several countries of Europe; the art and the taste of constructing libraries became more general than in any preceding age; and the only thing which appears worthy of remark, and rather unaccountable, is that, even after the progress of philosophy or bibliography, the Germans, in this department, have excelled every other people in Europe. It is universally acknowledged, that the best work of the kind that ever appeared, about that time, was the catalogue of the celebrated library of the count of Bunau, better known under the name of “Bibliotheca Bunaviana,” so remarkable, indeed, for number, selection, order, connexion, references, and universal interest. The only historical system of national literature exhibited in Europe was that of the Italian, by Tiraboschi. IVlr. Paterson supplied some important materials towards one among ourselves, in his “Bibliotheca Anglica Curiosa, | 1771.” He was an enemy to those systems of bibliography which are now generally practised on the continent; and he set no importance even on the newly-established classification of the “Universal Repertory of Literature,” published at Jena. 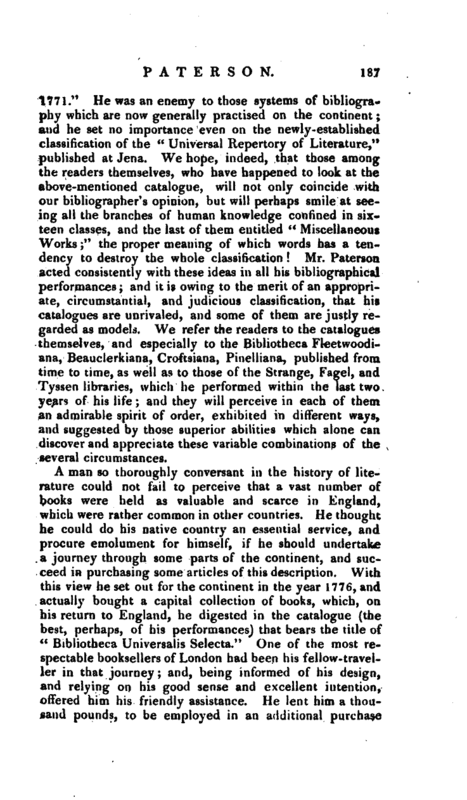 We hope, indeed, that those among the readers themselves, who have happened to look at the above-mentioned catalogue, will not only coincide with our bibliographer’s opinion, but will perhaps smile at seeing all the branches of human knowledge confined in sixteen classes, and the last of them entitled “Miscellaneous Works;” the proper meaning of which words has a tendency to destroy the whole classification! Mr. Paterson acted consistently with these ideas in all his bibliographical performances; and it is owing to the merit of an appropriate, circumstantial, and judicious classification, that his catalogues are unrivaled, and some of them are justly regarded as models. We refer the readers to the catalogues themselves, and especially to the Bibliotheca Fleetwoodiana, Beauclerktana, Croftsiana, Pinelliana, published from time to time, as well as to those of the Strange, Fagel, and Tyssen libraries, which he performed within the last two years of his life; and they will perceive in each of them an admirable spirit of order, exhibited in different ways, and suggested by those superior abilities which alone can discover and appreciate these variable combinations of the several circumstances. A man so thoroughly conversant in the history of literature could not fail to perceive that a vast number of books were held as valuable and scarce in England, which were rather common in other countries. He thought he could do his native country an essential service, and procure emolument for himself, if he should undertake a journey through some parts of the continent, and succeed in purchasing some articles of this description. With this view he set out for the continent in the year 1776, and actually bought a capital collection of books, which, on his return to England, he digested in the catalogue (the best, perhaps, of his performances) that bears the title of “Bibliotheca Universalis Selecta.” One of the most respectable booksellers of London had been his fellow-traveller in that journey; and, being informed of his design, and relying on his good sense and excellent intention, offered him his friendly assistance. He lent him a thousand pounds, to be employed in an additional purchase | of books, in hopes that he might have the money returned to him when the speculation was carried into exe* cution. Mr. Paterson, as usual, proved unsuccessful; and the generous friend, sympathising in his misfortunes, never claimed the return of his loan! 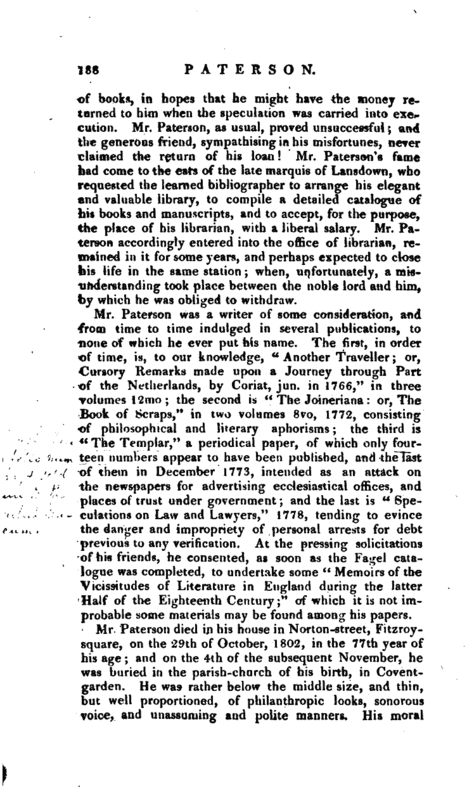 Mr. Paterson’s fame had come to the ears of the late marquis of Lansdown, who requested the learned bibliographer to arrange his elegant and valuable library, to compile a detailed catalogue of his books and manuscripts, and to accept, for the purpose, the place of his librarian, with a liberal salary. Mr. Paterson accordingly entered into the office of librarian, remained in it for some years, and perhaps expected to close his life in the same station when, unfortunately, a misunderstanding took place between the noble lord and him, by which he was obliged to withdraw. Mr. Paterson was a writer of some consideration, and from time to time indulged in several publications, to none of which he ever put his name. The first, in order of time, is, to our knowledge, “Another Traveller; or, Cursory Remarks made upon a Journey through Part of the Netherlands, by Coriat, jun. in 1766,” in three volumes 12mo; the second is “The Joineriana or, The Book of Scraps,” in two volumes 8vo, 1772, consisting of philosophical and literary aphorisms; the third is “The Templar,” a periodical paper, of which only fourteen numbers appear to have been published, and the last of them in December 1773, intended as an attack on the newspapers for advertising ecclesiastical offices, and places of trust under government; and the last is “Speculations on Law and Lawyers,” 1778, tending to evince the danger and impropriety of personal arrests for debt previous to any verification, At the pressing solicitations of his friends, he consented, as soon as the Fagel catalogue was completed, to undertake some “Memoirs of the Vicissitudes of Literature in England during the latter Half of the Eighteenth Century;” of which it is not improbable some materials may be found among his papers. 1 Gent. Mag. 1802. Sketch of his Life by Mr. Damiani and another by Mr. Mortimer ia European Mag. 1802.